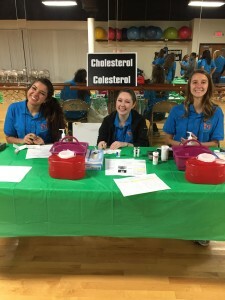 Grace College Spanish students Shoshannah Bontrager, Ashmine Minnix, and Katelyn Ware volunteered at We Care Warsaw, which was held in November. It is one thing to practice a foreign language in the classroom, but quite another to put your proficiency to the test in a real-world setting. For fourteen Spanish students at Grace College, Winona Lake, Ind., the test came in an opportunity to assist the Northern Indiana Hispanic Health Coalition (NIHHC) during We Care Warsaw on November 19. The annual event at Winona Lake Grace Brethren Church (Bruce Barlow, lead pastor) includes a health fair for local individuals and families with economic needs. Many of those served are Spanish speakers reliant on others to make important medical information understandable in their native language. To prepare for the one-day health fair, Grace students trained for five hours with NIHHC representatives to learn about the health examinations given at We Care Warsaw, how to help administer them, and to effectively communicate individuals’ results with them. During We Care Warsaw, 42 Hispanic participants obtained 340 free health examinations. These included body mass index, glucose, blood pressure, oxygen, pulse, anemia, and waist circumference measurement. “The students gave 110 percent with every person they helped,” said Stiles. In addition to the satisfaction received from helping others, Grace students learned first-hand about local Hispanic culture and the resources in place to assist Hispanics. Shoshannah will travel to Argentina next fall to fulfill a study abroad experience for her Spanish minor. The Grace College Spanish program combines on-campus courses with a required study abroad trip to one of Grace’s member institutions in Argentina or Spain. There, students apply their faith and skillsets in Hispanic culture. The Grace Spanish program equips students to interact in authentic situations like We Care Warsaw using Spanish and to live intentionally as global citizens.